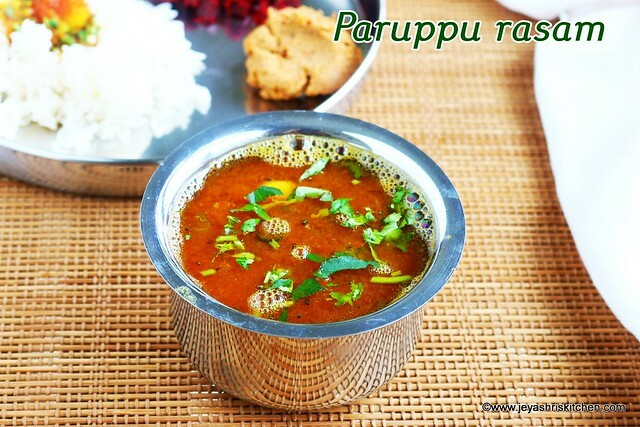 Paruppu rasam recipe with video. Rasam is a staple food in South Indian cuisine. We make different varieties of rasam in South India and the way we make the same rasam varies from house to house. Even we make rasam without rasam powder, rasam without tamarind too. Already i have posted few varieties of rasam in Jeyashri's kitchen, this paruppu rasam i recently tried at home, so wanted to share the recipe with you all. As it is mostly raining these days, i am making rasam almost 3-4 times in a week. 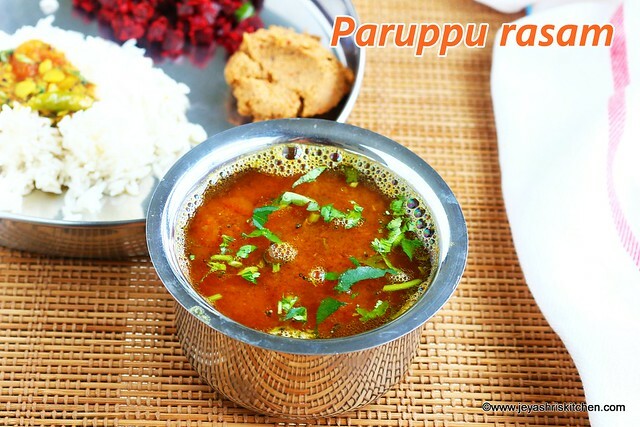 This recipe of paruppu rasam doesn't call for sambar powder or rasam powder. And i can say it is a perfect Bachelor recipe. Grind the tomato into a mixie and make a puree. Extract thin tamarind extract from the gooseberry sized tamarind, using 1 cup water. Pound the pepper and cumin seeds in a mortar and pestle. In a sauce pan add the grind tomato mixture. Alternatively you can chop the tomatoes into fine pieces and add to it. Slit the green chilies and add to it. Add turmeric powder, salt and asafoetida. Add 1 cup of water to the cooked and mashed toor dal. Add the pepper jeera powder to the sauce pan. Add the toor dal water to the sauce pan. Once the mixture froths up, switch off. Temper mustard seeds and crushed garlic(if adding) in ghee and add it to the rasam. Paruppu rasam is ready to serve with hot rice. A perfect rasam for this rainy weather. We had with beetroot curry and thengai thogayal. You can add 1 red chili while tempering the mustard seeds. Always use freshly ground pepper and cumin seeds for paruppu rasam. no rasam or sambar powder needed? No this is a bachelor type of rasam, without any powders. You can check my tomato rasam, that recipe has sambar powder.